After the Glorious Revolution, a not so glorious age of lawlessness befell England. Crime ran rampant, and highwaymen, thieves, and prostitutes ruled the land. Execution by hanging often punished the smallest infractions, and rip-roaring stories of fearless criminals proliferated, giving birth to a new medium: the newspaper. In 1724, housebreaker Jack Sheppard--a "pocket Hercules," his small frame packed with muscle--finally met the hangman. Street singers sang ballads about the Cockney burglar because no prison could hold him. Each more astonishing than the last, his final jailbreak took him through six successive locked rooms, after which he shimmied down two blankets from the prison roof to the street below. Just before Sheppard swung, he gave an account of his life to a writer in the crowd. Daniel Defoe stood in the shadow of the day's literati--Swift, Pope, Gay--and had done hard time himself for sedition and bankruptcy. He saw how prison corrupted the poor. They came out thieves, but he came out a journalist. 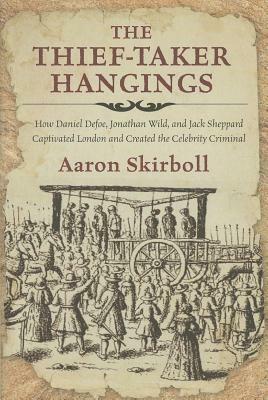 Six months later, the author of Robinson Crusoe and Moll Flanders covered another death at the hanging tree. Jonathan Wild looked every bit the brute--body covered in scars from dagger, sword, and gun, bald head patched with silver plates from a fractured skull--and he had all but invented the double-cross. He cultivated young thieves, profited from their work, then turned them in for his reward--and their execution. But one man refused to play his game. Sheppard didn't take orders from this self-proclaimed "thief-taker general," nor would he hawk his loot through Wild's fences. The two-faced bounty hunter took it personally and helped bring the young burglar's life to an end. But when Wild's charade came to light, he quickly became the most despised man in the land. When he was hanged for his own crimes, the mob wasn't rooting for Wild as it had for Sheppard. Instead, they hurled stones, rotten food, and even dead animals at him. Defoe once again got the scoop, and tabloid journalism as we know it had begun. Aaron Skirboll is the author of The Pittsburgh Cocaine Seven and has written about America's first professional songwriter for the Pittsburgh Post-Gazette, Ernest Hemingway's last days for American Way magazine, and the history of the phone booth and cell phone etiquette for The Morning News. He lives in Pennsylvania.